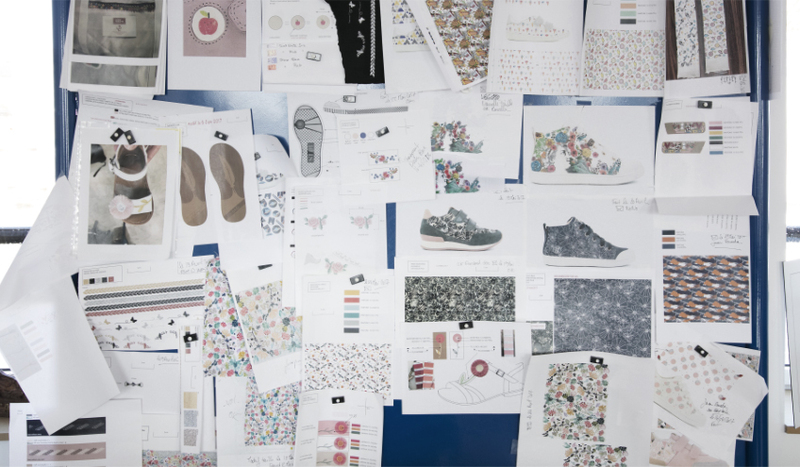 In the heart of Vendée, a small village in the French city of Chambretaud, we meet ShoeMakers Group - previously known as RAS kids - a company from which multiple children’s shoe brands, such as Pom d’Api, have originated. Pom d'Api was created in 1973 by Guy and Yvon Rautureau, the great-grandchildren of artisan cobblers who had been in the business since 1870. In 2016 the brand was acquired by private investors who wanted to keep the Pom d'Api heart and soul alive and carry on their tradition of expert know-how; these two missions were very important for the company's direction. 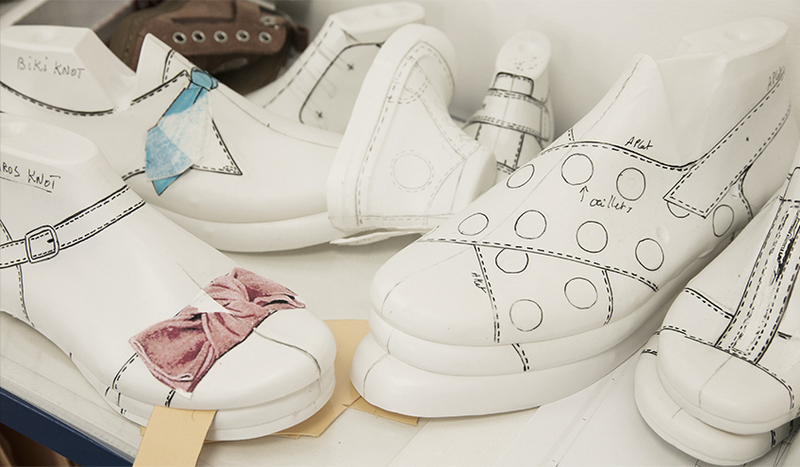 Recently, the brand's employees have moved to a new atelier, located a few kilometres away from their old workshop, and continue the Pom d'Api time-worn tradition of creating quality children's shoes. In the yard stands a piece of work from artist Hervé Di Rosa - a reminder of Rautureau’s family passion for art. From the building’s corridors we're greeted by the rich and musky smell of leather and brand new shoes. 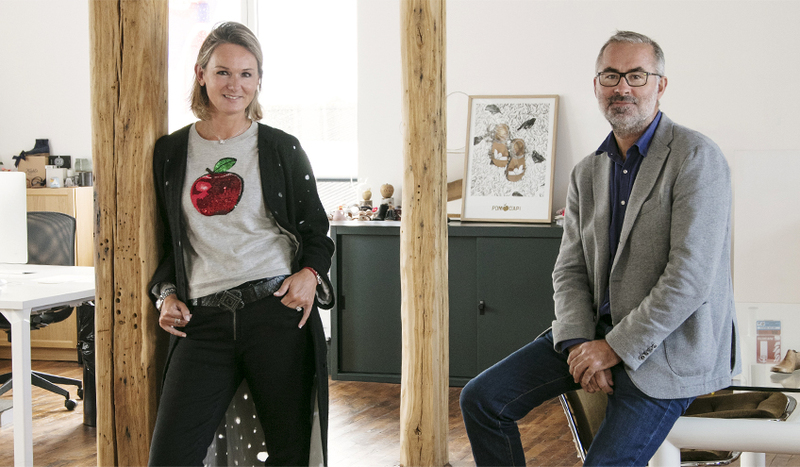 Alexandra Bois-Aubouin, President, and Arnaud Bayeux, CEO, from ShoeMakers Group took us around for a guided visit and told us more about the Pom d'Api story. How was the brand Pom d’Api born? It is a 100% Vendéan [from the village of 'Vendée'] brand and a family story. The grandfather, who was a cobbler, decided to start making shoes, clogs - to be more precise, and it was a huge success. There were no emblematic children’s shoe brands at that time and they managed to follow the trends while staying unique and keeping the Vendéan know-how alive. They were very passionate about product quality and solidity. What we see today is the legacy of this period, of the transmission of knowledge, of the continuity. The company stayed the same after it was acquired. We’re only eight kilometres away from the Rautureau group, for which we have a lot of affection. Alexandra, what image did you have of the brand before it was acquired? Like everyone else, I had in mind the image of a beautiful brand every child should wear, especially when it comes to a child’s first steps. However, I didn’t realise the complexity of the shoe-making process. To make one pair of shoes, there are 200 different steps. We could always forego a few of these 'invisble' steps (like removing a few stitches inside the lining) but those are really important if we care about the child’s comfort and well-being. And we’re always looking for the best materials there are. Shoes are one of the most difficult products to create, and children’s shoes are even more complex. The difficulty for us is to create shoes from size 18 to 40 with different models for both boys and girls. You are very attentive to quality and comfort. how does this translate in your products? We have our shoes tested by children at a local school near Chambretaud. We are one of only three or four [shoe] brands to still produce our products in France and we are the only ones to be accredited by the French Association of Podiatrists for our models dedicated to babies’ first steps. It is imperative that the foot arch is respected and the ankle well-supported. 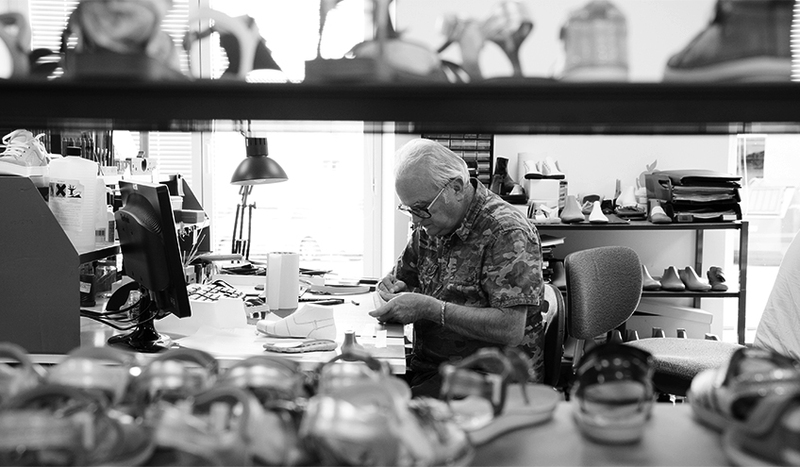 We also have a research department, which is in charge of thinking about all of these problems, looking for new shoe soles and making sure our products are comfortable. Your workshops are right here, with a lot of machinery. What’s the conception process of a pair of shoes? We start with a shoe sole model made from resin, then we focus on the rubber sole. Each shoe is built like a puzzle, piece by piece, manually but also with cutting machines, sewing machines and we also use more sophisticated tools such as a 3D printer to shape our products. We’re very careful when it comes to the fabric and the inside of the shoe so it can last longer, be healthy and comfortable. 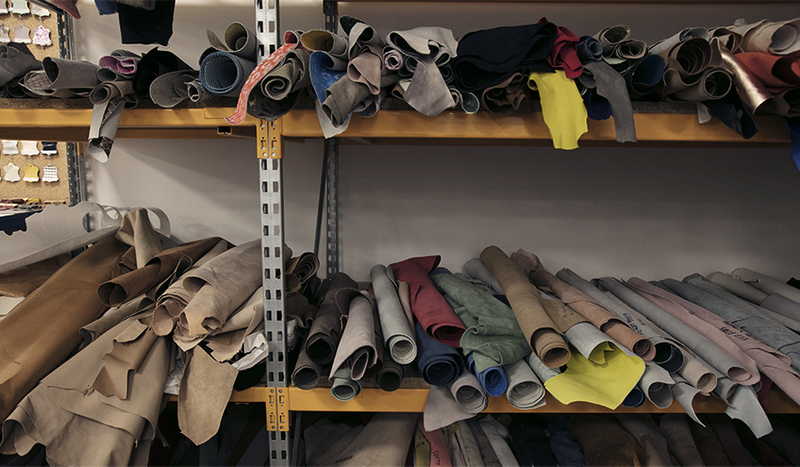 Our different types of leather all come from Italy, Spain and Portugal. We need two and a half hours to build a prototype here in France, then 190,000 pairs are fabricated each year in our factory in Tunisia. How is your team structured today? Of the 180 people employed by the group, 120 are dedicated to production, around twenty work in our boutiques, and fifteen on our prototypes. It’s a small company so everyone does a little bit of everything. It usually takes us four months to come up with the whole collection. We start with concepts and styles, and we also find inspiration in the research of materials we do every season to be as close as possible to the trends. It’s a race against time but we want to work like this so that no one has the same materials as we do and we can stick even more to adult fashion trends. What are Pom d’Api’s most emblematic pieces? We are renowned for our shoes designed for babies’ first steps and for our sandals. They are robust and our rubber soles are of the best quality. Moreover, we apply a small piece of crocodile leather or a touch of rabbit fur on our leather shoes as our trademark. We often make duo-material models. What does a brand that has existed for so long do to keep renewing itself, while also keeping its DNA intact? We always find inspiration from previous trends. One or two years ago, we released sandals with a strawberry detail that were first launched 20 years ago. We updated the model and used our new techniques. The Pom d’Api DNA is everything we’ve done in the past and everything we will do in the future. Who is the typical Pom d’Api child? They are quite clever, funny, a mix between tradition and modernity. They can be very classical, but crazy at times. They’re naughty. We export a lot of our production so there’s also an international element. We have shops in Belgium, Switzerland, Moscow, Kuwait etc: 50 per cent of our turnover comes from overseas. It’s the French savoir-faire that attracts so many people, and also, the fact that they can’t find a lot of children’s brands in their countries. Our greatest strength is our quality, because an ill-conceived shoe is the worst thing. It’s different from an article of clothing that can be imperfect when it comes to its cut, a shoe needs to be irreproachable. Actors Jennifer Garner and Ben Affleck often go the the Petits Chapelais in New York, a multi-brand store where our products are sold and they’ve been clients of ours for a long time. The Swedish Royal family can also be found among our most loyal customers, it’s lovely. What would be Pom d’Api’s motto? It comes from a joke, but its good representation of our mind-set. We have this quote from the movie Toy Story written in our research facility, “To infinity and beyond.” It’s the idea that we always need to go farther, to think of the impossible and still go for it. We don’t want to stay in a routine and rest on our laurels. What are your favourite kid-friendly addresses? Click here to see 102 more products that match your search in the outlet section.